Search for all "Human HME-MMP12 ELISA kit"
Capture Antibody: 0.5 mg/mL of mouse anti-HME-MMP12 monoclonal antibody (clone 705D10). Detection Antibody: 0.5mg/mL of HRPO-conjugated anti-HME-MMP12 mouse monoclonal antibody (clone 706F9.01). Standard: Each vial contains a solution of recombinant HME-MMP12 (concentration indicated on the vial) produced, purified and concentrated from transfected eukaryotic cells. A 8 point standard curve using 2-fold serial dilutions in sample dilution buffer, starting at a concentration of 1μg/ml is recommended. 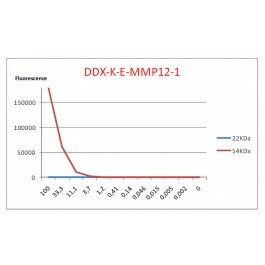 The human HME-MMP12 ELISA kit is for quantitative determination of HME-MMP12 concentrations in human cell culture supernatants and biological fluids (plasma, serum, sputum). This kit is for research purpose only. HME-MMP12 domain structures and maturation steps were described by Shapiro et al, JBC, 1993, 268, 23824-23829. Proteins of the matrix metalloproteinase (MMP) family are involved in the breakdown of extracellular matrix in normal physiological processes. HME/MMP-12, also called metalloelastase, is critical for invasion and destruction in pathologies such as aneurysm and emphysema. . HME mRNA and protein were previously described as expressed in human alveolar macrophages (Curci JA et al, 1998, J Clin Invest, 102(11):1900-10). The predicted molecular mass of the HME proenzyme is 54 kDa and readily undergoes NH2- and COOH-terminal processing to an active 45KDa form and a mature 22 kDa form. HME is a unique human metalloproteinase that displays elastolytic activity. 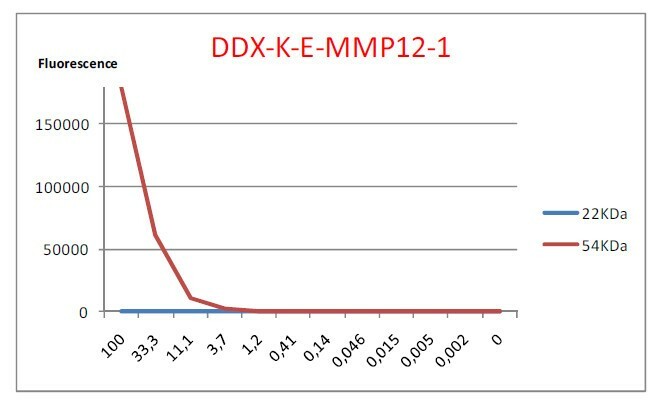 We have isolated HME-MMP12 cDNA from a human CD34+-derived DC (GM-CSF+TNF) library. Expression analysis revealed HME-MMP12 expression in lung and placenta. Anti-HME-MMP12 monoclonal antibodies were obtained after mice immunization with HME-MMP12-transfected eukaryotic cells. These antibodies were used to set up a quantitative immunoassay for the detection of human HME-MMP12 (Demedts IK et al, 2006; Thorax, 61:196-201; Lapan et al, BMC Pulmonary Medicine, 2010, 10:40). All the reagents should be aliquoted before storage. Minimize repeated freeze and thaw. Refer to expiration date on all reagents prior to use. Do not mix reagents from different kits unless they have the same lot number.